For the past few months I've been really into skin care. Makeup can only go so far you need a good skin care routine in order for your skin to look its best. With your skin looking its best your makeup will look beautiful over top. There's no point on spending tons of money on really expensive makeup if you're skin doesn't look the greatest. You want the perfect base underneath your makeup. Keep in mind these are products that have worked for my skin & I'm not saying it will work for everyone. Everyone has different skin & if something works for you doesn't mean it will work for me. I also have oily to normal skin. My skin concerns have always been redness, texture, blackheads/pores & breakouts. *Also I am not a professional what so ever I just learned things on my own with doing my research on things. The first thing I do when I wake up is of course brush my teeth then I wash my face with this Philosophy one-step facial cleanser. It cleans my face really good making it feel so fresh. It does a really good job removing all the makeup from my skin including eye makeup. I used to use this in the mornings & at night which never bothered my skin. 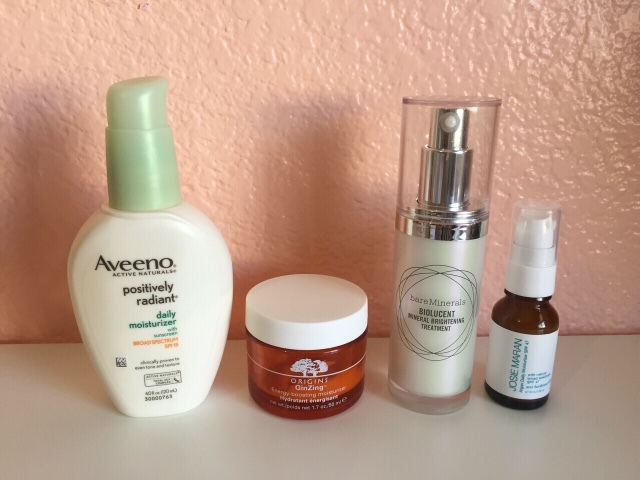 I can get really sensitive skin sometimes but I recently added some new things to my night time routine about a month ago or so which I will get into in a bit. This face wash leaves my face hydrated & also balances your skin so you don't need to go in with a toner afterwards if you don't want to. 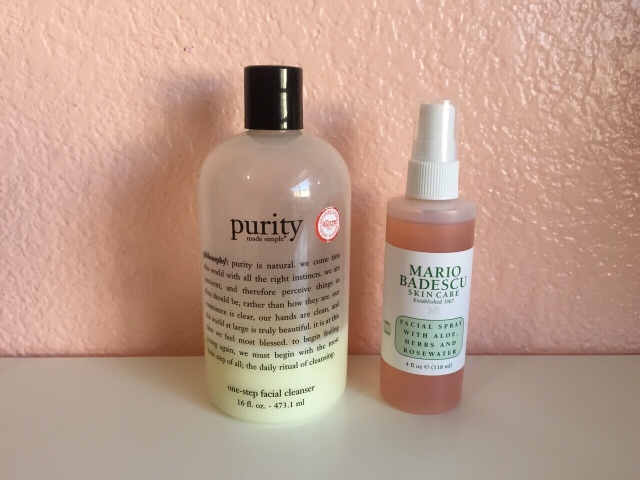 Right after I was my face I spray the Mario Badescu rose water facial spray. It can be used for many different things. When I first purchased it I would use it as a setting spray for my makeup. Now I've been using it as a toner. Once in a while after I wash my face I will spray this one my face, not everyday maybe every 1-2 days just depends on my mood. I read that rose water is also really good for break outs/acne so that's when I started using this in my skin care routine instead of a makeup setting spray. Once the Mario Badescu spray has fully dried on my face I moisturize. These are just a few moisturizers that I use, I don't use the same one everyday cause I don't want my skin to get used to it so every day I'll switch off with moisturizers. The Aveeno positively radiant moisturizer is one of my favorites to use. It has SPF in it & it also helps brighten your skin with use. I remember back when I first started using it a week or two in my sister in law noticed a difference in my skin. She said my skin looked so glowy. I was only wearing this no makeup & she said she could have sworn I had foundation on with how good my skin looked. With all of my moisturizers I always mix a pump of the Bare Minerals Biolucent mineral brightening treatment. It's obviously a skin brightening treatment & it'll help get of any dark spots you might have. I like this for both those reasons. After my zit is going away it'll leave a dark spot behind sometimes that will literally linger on my skin for a few weeks after that darn zit has gone. This product also gives my skin that radiant glowy look which I really like even though I have more oily skin. If the moisturizer I'm using doesn't have SPF which most don't except that Aveeno one I use the Josie Maran argan moisturizer with SPF 47 then go over top with a moisturizer. I hate to be out in the sun, absolutely hate it especially since I'm so fair skinned if I get any sun on my face it turns red & that's something I've never liked. Protecting my skin from the sun was always so important to me. This product is great cause like most sunblocks it doesn't leave that gross greasy feeling afterwards & I hatted having to put sunblock on my face for that reason. 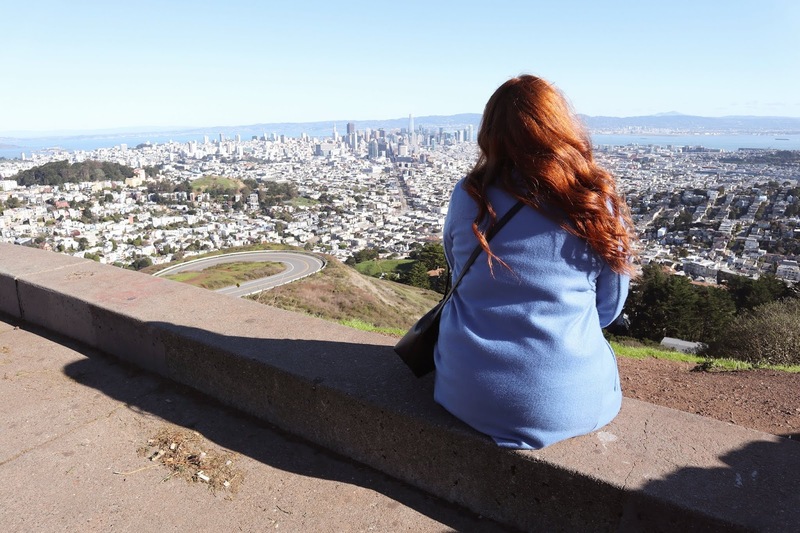 Now owning a SPF specifically for the face is really nice also SPF of 47 is really good. I then go in with any eye cream. I don't have any favorites or one that I use all the time. 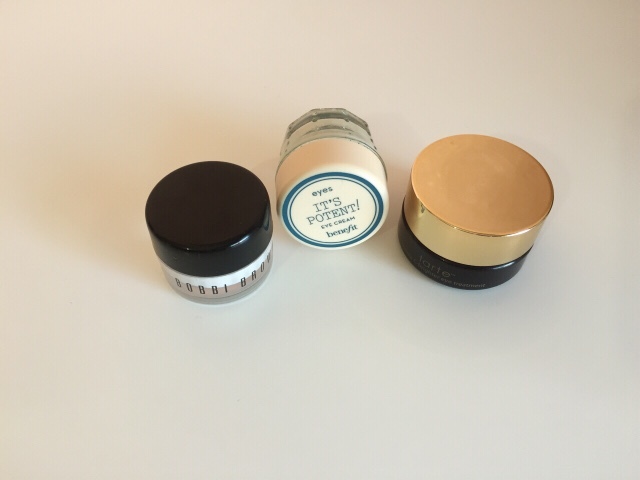 Like my moisturizer I also switch off everyday with my eye creams. These are just a few of the ones I own. 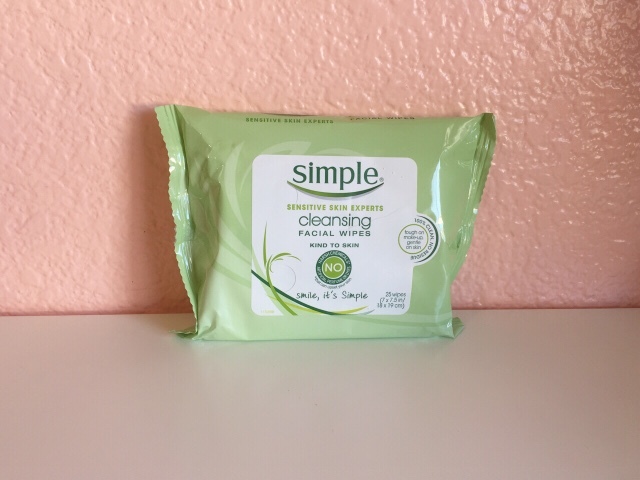 At night time depending if I have on makeup or not I use the Simple face wipes. I don't wear makeup everyday. To be completely honest I only wear makeup on the weekends or if I do during the weekdays it's only cause I'm going to do something instead of just running errands. So if I am wearing makeup when I'm going to begin my night time routine I use these makeup wipes. I'm not picky when it comes to makeup removal wipes just as long as they don't burn my face. These are the second brand I tried since the first ones from Neutragena burned my skin. 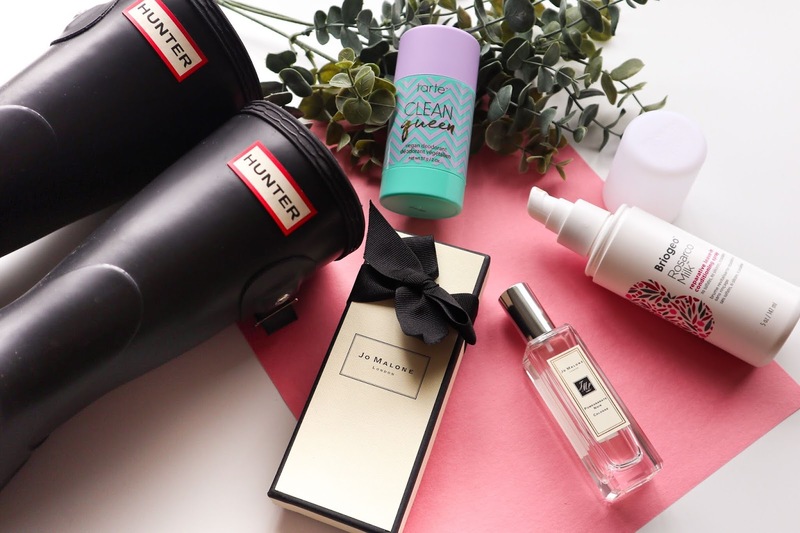 I've been really liking this brand & I've continued to repurchase them. *I also really like to use coconut oil to remove my makeup if I don't end up using these wipes. This is one of the newest editions to my skin care routine; the Clarisonic Mia 2 along with their cleanser. I've owned this for about a month now & I LOVE it!!!!! I was always so interested in them & owning one so I recently caved & ordered it. My skin was acting really funky so I thought it was the perfect time to begin using it. In so many reviews on this I heard that when you first start using it your skin goes through a "purging" stage since your skin is going through such a deep clean it's pulling out all that bacteria from deep down in your skin out to the service which will cause you to break out. It did do this to me, but you're suppose to continue using it cause it'll all be worth it. It's so true now my skin is looking so clear so soft. I have or should I now say had a lot of blackheads along with large pores on my nose & its all starting to minimize & disappear! I'm so happy I finally own this I will never not use this. Since owning this I don't have to exfoliate as much since it does that pretty much. It's also so much fun to use. I'm thinking of doing a whole review on this sometime soon. I also have before & after pictures of my skin but I'm still not sure if I want to share them since I'm kinda embarrassed haha. After I clean my face I tone. 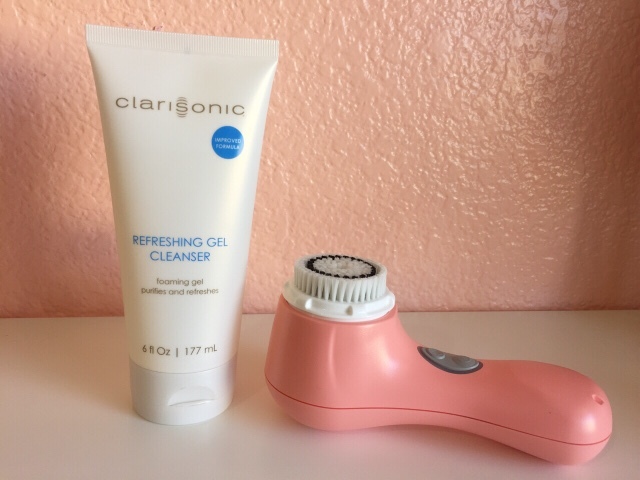 Once again with this Clarisonic cleanser it balances your skin so you don't need to tone it if you don't want to. I like to so for night time I switch off every day with these two products. 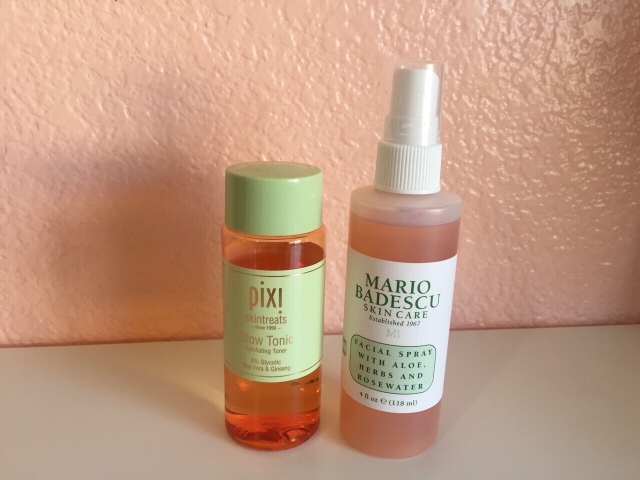 I already spoke about the rose water so I'll just talk a little about the Pixi glow tonic. This is a toner & it also is suppose to help brighten your skin something I'm obviously very into. I heard some good reviews & wanted to try it for myself. I have noticed in the morning when I wake up my skin looks a lot brighter so I think its working. I recently got this Korres wild rose advanced brightening sleeping facial a little over two weeks ago when I went to Sephora for an event they were having & this come in the goodie bag they were giving out. Once again when I saw the word brightening I knew I was going to love it. I've been using it everyday since & I'm loving it. As soon as I started using this all the dark spots I had from past break outs were disappearing so much faster than before. As soon as I'm out of this I'm definitely going to purchase the full size! It also has such a lovely sent to it. Once all that is done it's finally time for my night time moisturizer. Same as morning time I alternate my moisturizers with these two. Korres greek yoghurt moisturizer is a different kind of moisturizer I've ever used. 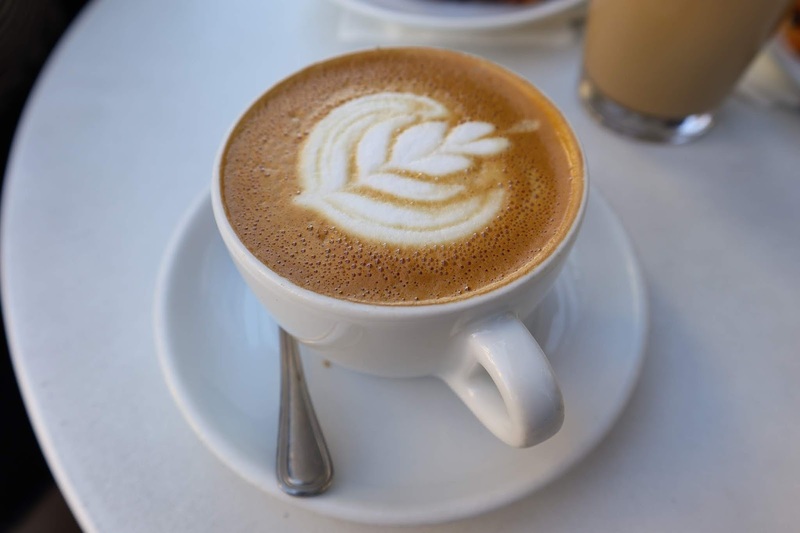 The consistency is very liquidly kinda milky if that makes sense. I really like it & it really keeps my face hydrated through the night. It's says it nourishes your skin, it's filled with different vitamins & brightens your complexion. The Origins night-a-mins is a thick cream. I love it! This one really hydrates my skin SO well since it is so thick & the smell is amazing. My skin always feels so soft in the morning when I wake up. Right after my moisturizer I finally add my beauty oil. I've been using the Boscia since December/January I believe, I can't really tell if it's done anything for my skin but then again it hasn't done anything bad either. Once I'm done with this bottle I'm not sure if I'll repurchase it, I think I'm going to want to look into a different one since I know this is going ot be lasting me a while & my skin is probably used to it by now. But I do like it. If I have a break out or one I see starting to form I will use this Mario Badescu drying lotion.This is literally a zit zapper, 9 out of 10 times when I apply this at night before I go to to bed in the morning when I wake up its either completely gone or almost completely gone. Everyone needs this in their life. I can't live without it. There you guys have it, my day time & night time routine. I hope you guys enjoyed it & hopefully learned something. Let me know if there is anything you may like that you use for your skin routine. I would love to hear your thoughts & or opinions even try something new as well.